Whats keeping todays media and broadcast operators up at night? To find out, just walk the floor of any 2013 broadcast industry trade show. Only a few short years ago we were obsessed with the digital transition and migrating to HD operations, followed by adoption of 3-D technologies. And now, todays big challenge (or opportunity, if youre an optimist) is the pressure to deliver content on the complete spectrum of user devices and platforms, and extend the infrastructure to support upcoming ultra HD (UHD) formats. The challenge boils down to this: how to deliver OTT and multi-platform services in the most cost-effective and bandwidth-efficient manner possible, without compromising the consistently high HD picture quality both today and into the future that discriminating viewers demand. In order to take the consumer TV and multi-platform viewing experience to the next level, operators must tackle the bandwidth question and bandwidth savings is all about compression. As the worthy successor to todays state-of-the-art codec, H.264/MPEG-4 Advanced Video Coding (AVC), the emerging High Efficiency Video Compression (HEVC) standard offers great promise for next-generation 4K distribution networks to support UHD. 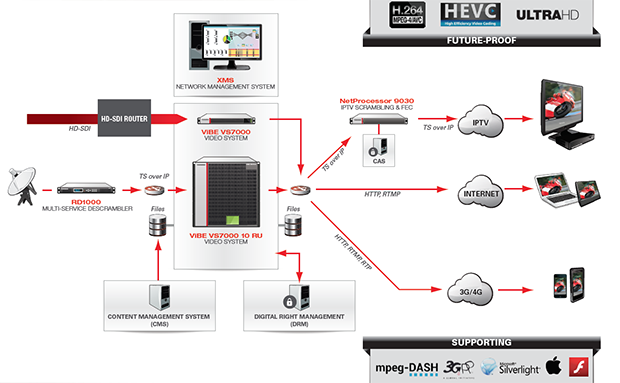 Still in development, HEVC has already been demonstrated to offer a bit-rate reduction of up to 50 percent over H.264. For true visionaries, the new standard is paving the way to 8K UHD in resolutions up to 8192x4320. The Bandwidth Conundrum In the meantime, consumer demand is driving OTT video delivery to an ever-growing array of user devices ranging from gaming consoles, mobiles, and tablets to PCs and smart TVs. Concepts like TV Everywhere, Connected TV, and second-screen TV viewing that seemed so novel just a few years ago are now defining broadcasters content distribution strategies. The opportunities have never been greater for operators to latch onto these new paradigms to grow new audiences such as younger viewers and reduce churn in their pay TV services, and to increase revenue streams through more targeted advertising. For these services to be successful, however, they must operate as an extension of conventional broadcast television by offering the same quality levels and viewing experience that consumers are accustomed to on their home TVs including HD resolution, multiple languages and subtitles, and a consistent graphical user interface. Another OTT challenge for traditional broadcasters is the fragmentation in the adaptive bitrate (ABR) streaming technologies that drive the multi-platform world. In order to reach the widest audience, an OTT service must be delivered to ALL available platforms and that means programming for the full range of ABR technologies including HTTP Live Streaming (HLS) or Smooth Streaming to address mobile phones and tablets (including Apple iOS, Android, and Windows devices), as well as PC, Mac, and Linux browsers. The good news here is that a standardization effort is well underway in the form of the emerging Dynamic Adaptive Streaming over HTTP (DASH) standard, also known as MPEG-DASH, which will enable high-quality streaming of content over the Internet via conventional HTTP Web servers. As more and more device manufacturers embrace the MPEG-DASH standard, OTT delivery will be greatly simplified but in the meantime, operators must reserve enough bandwidth to accommodate each ABR variation. By definition, traditional broadcasting is a multicast workflow that sends a single stream to many viewers. OTT, however, is a unicast, point-to-point distribution mechanism that presents obvious bandwidth challenges as the number of users multiplies; since every 1,000 viewers represents 1,000 streams, it follows that you need 1,000 times the bandwidth. This inefficiency has dire economic consequences for large-scale OTT providers that rely on content distribution networks (CDNs) to deliver their services over the open Internet, since most CDN providers base their fees on user volume. The ultimate OTT irony, therefore, is that the more popular the service is, the more expensive and less profitable it is to operate unless bandwidth usage is somehow reduced and thats where HEVC compression enters the picture. Since HEVC will allow operators to send the same streams using half the bandwidth, OTT will not only become a more profitable venture but the picture quality will be able to keep pace with consumers ever-evolving expectations as UHD delivery appears on the horizon. Future-proof design. The encoding platform should not only support todays H.264 delivery via all major ABR streaming formats but also be extensible enough to accommodate HEVC, MPEG-DASH, and other emerging standards into the future through a software upgrade. Robust functionality. With the right encoding solution, operators should be able to approach bandwidth efficiency from two perspectives: maintaining current levels of video quality while using less bandwidth, or improving video resolution at the same bit rates. The system should include capabilities for encoding live content as well as offline encoding and pre-recorded files for delayed streaming; e.g. VOD services and catch-up TV. In addition, the system should provide content protection features and support subtitles and multiple languages. Pristine picture quality. In the quest for bandwidth efficiency, quality should never be a victim especially since viewers are holding the quality of their OTT content to the same standard as home TV output. Reliability. It goes without saying, but every second of downtime in an OTT operation represents a significant loss of revenue. Therefore, the encoding solution should provide multiple mechanisms and redundancies for each delivery platform to prevent any service interruptions. The Future is Here Chip manufacturers are already introducing 4K HEVC decoder chipsets, which is driving some encoding manufacturers to begin building HEVC functionality into their platforms. 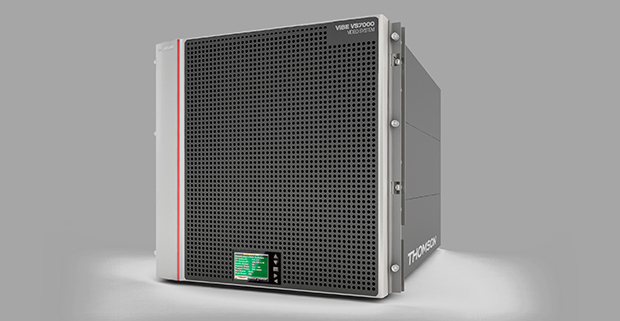 One of the first worldwide implementations of HEVC is Thomson Video Networks ViBE¢ VS7000 multi-screen video encoding/transcoding system, which features the companys own HEVC compression technology. Attendees at the upcoming IBC2013 show will get a glimpse of the OTT future when HISPASAT, a leading satellite transmission operator with a strong presence in South America, demonstrates a trial deployment of the VS7000 to deliver live HEVC-encoded Ultra HD content to air via its satellite platform. In addition, Sky Italia, Italys leading DTH satellite pay TV provider, has launched a trial demonstration of the VS7000 to create an end-to-end Ultra HD platform from content acquisition and transcoding in HEVC, to delivery and display on 4K television sets. With these demonstrations and technology advances, can widespread commercial adoption of HEVC and Ultra HD delivery over 4K networks be far away? Since HEVC already demonstrating bandwidth reductions of up to 50 percent for 4K delivery, the future looks bright for HD and UHD content delivery on any type of device and network especially when HEVC is combined with exciting new technologies such as MPEG-DASH, eMBMS, and LTE. In the near term, the bandwidth savings afforded by these technologies translate directly into reduced operating expenses, while easing the path of video delivery in todays multiplatform world.